Energy Technologies, Inc. (ETI) is dedicated to providing highly reliable, yet cost effective product solutions for the computer and power conditioning requirements of critical applications including the military, industrial, medical, and telecommunications sectors. Founded in 1991, Energy Technologies, Inc. has become the leader in rugged power products with their field-proven, highly-reliable and cost effective designs. Utilized in tens of thousands of installations worldwide, these product solutions cover the production, conditioning, storage and control of AC and DC power for a wide range of environments. These rugged products meet the demands and rigors of defense, government, industrial, medical and telecommunications sectors. Mobile applications include shelters, vehicles, shipboard, submarine, aircraft and field deployment. Stationary applications consist of permanent or temporary facilities, factories, process plants, utilities, networks, even offshore platforms and desert pipelines installations. Both the Rugged Systems™ and Military Power® (COTS and Mil Spec) lines are comprised of intelligent UPS, power distribution units, frequency converters, inverters and battery systems. Each is available in rack mount, NEMA or custom enclosures suited for mechanical shock, vibration as well as extremes in temperature and humidity. The intelligent features include the ability to monitor and control the equipment and their loads via local and/or remote interfaces such as SNMP and HTTP. 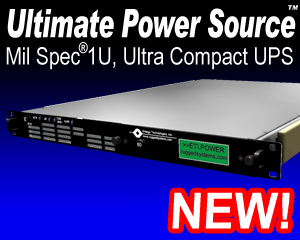 The World Power™ versions operate from all voltages and frequencies worldwide including aircraft or vehicular power. The Tactical Power® series includes deployable inverters, converters, and global UPS that operate from either vehicle DC or whatever AC is locally available. The Tactical Generator® line includes lighter weight, deployable generators and packaged power plants. Tactical Fuel Cells® include complete portable power systems that replace traditional generator sets that are heavier and noisier. Tactical Field Office® systems include modular/deployable field-office desks with built-in power conditioning/backup plus Tactical Computer Workstations® and Tactical Task Lighting™. Operating from available AC or DC power sources, the Tactical ECU™ units provide heating and cooling for shelters and/or equipment enclosures. The Tactical Solar® family consists of high-performance solar panels that are both rugged and flexible, charge controllers, battery modules and complete solar power solutions for hostile environments. The solar panels configurations include foldable blankets and shelter flies. Tactical Wind Turbines® are light-weight, easily setup power sources that can run independently or as a hybrid system with the solar. These turbines are designed to operate in minimal wind conditions. The Tactical Micro Grid® pulls all of this together with an intelligent controller managing the various power sources, energy storage devices and equipment loads to maximize performance and economy for the given priorities. From the sedate office and control room environments to the shock and vibration of shipboard and military vehicle applications to the temperature extremes of unprotected desert installations, ETI's products have become the Standard in rugged power applications today.